Acoustilay 3 is installed as easily as conventional carpet underlay but with the added benefit of superior noise insulation. It does not limit access. It is simply laid under most floor finishes and replaces existing underlay. It can also help to meet Part E of the Building Regulations for concrete floor constructions. 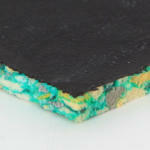 Acoustilay 3 is most suitable for situations that only require impact noise insulation. It has the same resilient base as the 8 and 15 models, but the attenuating layer is reduced to a thinner, more flexible membrane. The overall thickness of Acoustilay 3 is 10mm and it is supplied in 1200mm x 1200mm pieces. Acoustilay continues to be a market leading acoustic underlay product. Arising from years of research, the range was created to be both 100 per cent recyclable whilst still offering the acoustic properties necessary to help homeowners minimise the effect of noise. A major feature of the Acoustilay range is the substantial commitment to sustainability. The material is manufactured entirely in the UK, helping to cut down the company’s carbon footprint. The barrier mat material – which is used to provide the mass – can be manufactured using a combination of pre, mixed and post-industrial waste sources. The polymer structure of the PVC free material used is engineered to absolutely minimise pollution, and releases nothing toxic when burned. Acoustilay has always been a popular material amongst specifiers and end users due to the high-quality acoustic performance that it offers, as well as the ease with which it can be installed. It’s also very popular amongst normal homeowners looking to upgrade the sound insulation of floors within their property.